Propagandism is not, as some suppose, a "trade," because nobody will follow a "trade" at which you may work with the industry of a slave and die with the reputation of a mendicant. The motives of any persons to pursue such a profession must be different from those of trade, deeper than pride, and stronger than interest.GEORGE JACOB HOLYOAKE. 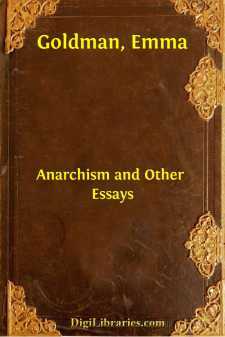 Among the men and women prominent in the public life of America there are but few whose names are mentioned as often as that of Emma Goldman. Yet the real Emma Goldman is almost quite unknown. The sensational press has surrounded her name with so much misrepresentation and slander, it would seem almost a miracle that, in spite of this web of calumny, the truth breaks through and a better appreciation of this much maligned idealist begins to manifest itself. There is but little consolation in the fact that almost every representative of a new idea has had to struggle and suffer under similar difficulties. Is it of any avail that a former president of a republic pays homage at Osawatomie to the memory of John Brown? Or that the president of another republic participates in the unveiling of a statue in honor of Pierre Proudhon, and holds up his life to the French nation as a model worthy of enthusiastic emulation? Of what avail is all this when, at the same time, the LIVING John Browns and Proudhons are being crucified? The honor and glory of a Mary Wollstonecraft or of a Louise Michel are not enhanced by the City Fathers of London or Paris naming a street after them—the living generation should be concerned with doing justice to the LIVING Mary Wollstonecrafts and Louise Michels. Posterity assigns to men like Wendel Phillips and Lloyd Garrison the proper niche of honor in the temple of human emancipation; but it is the duty of their contemporaries to bring them due recognition and appreciation while they live.